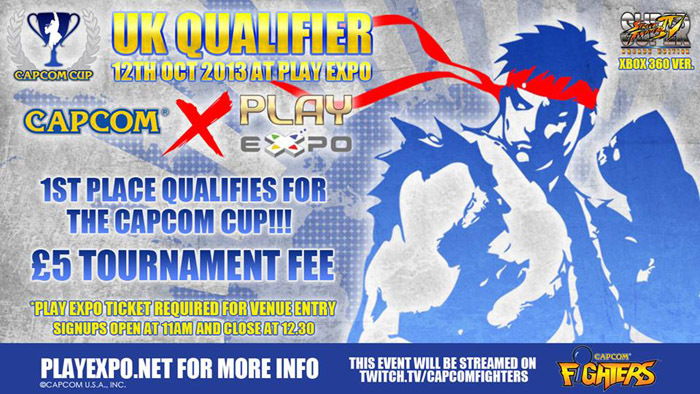 Play Expo will host a Capcom Cup qualifier for SSFIV, the winner of which will be sent to San Francisco to compete in the 8-man Capcom Cup tournament on 15th December 2013. Registration: On site. If you are coming over from abroad/far distance, please use the contact page and send a message. Who can enter: The tournament is open to players worldwide. Venue: Play Expo at EventCity. Travel info here. Cost: Tournament Entry is £5. You will also require a Play Expo ticket, which can be purchased here. Be sure to check out all the pinball machines while you are there! Prizes: First place: Flight & accommodation to San Francisco, Capcom Cup qualifying spot, 70% of tournament pot. Second place: 20% of tournament pot. Third place: 10% of tournament pot.